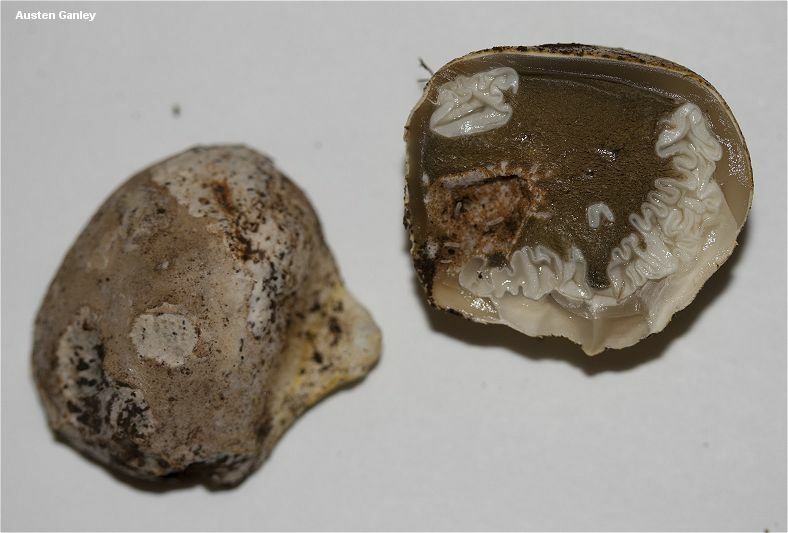 Ileodictyon cibarium is primarily known from New Zealand and Australia, though it has been recorded in Chile (and in Africa and in England as an introduced organism). 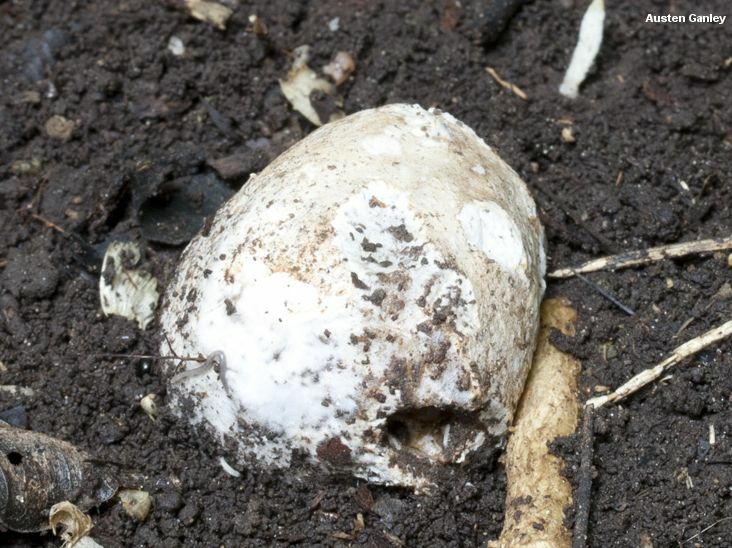 It is a stinkhorn, but it might better be labeled a "stink cage," since there isn't anything horn-like about it. 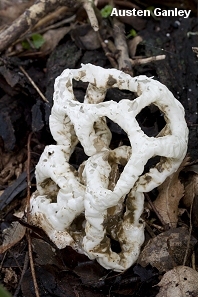 Clathrus ruber and similar species of Clathrus also form cage-like structures, but they remain rooted to the substrate; Ileodictyon cibarium detaches itself from its base. Additionally, its branches are white, rather than red to orange. Ileodictyon gracile is a similar species with slender, more graceful arms. 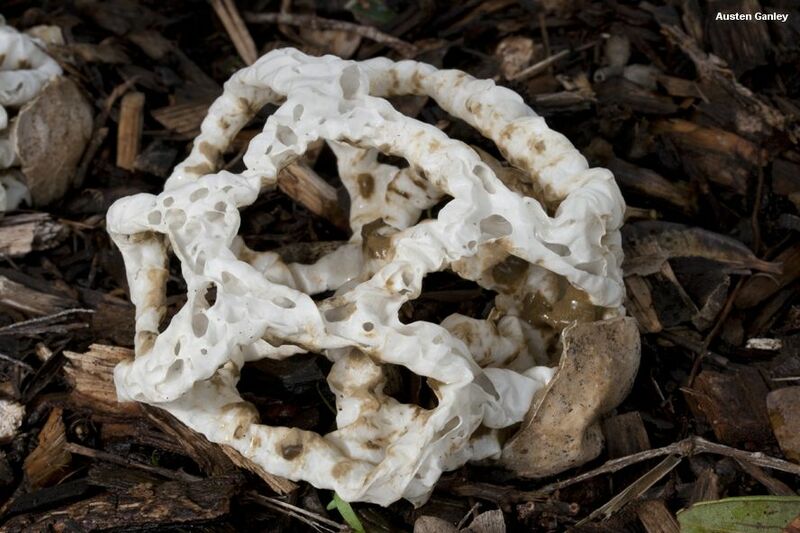 Ecology: Saprobic; growing alone or gregariously; in woods or in cultivated areas; year-round in tropical and subtropical areas; New Zealand, Australia, and Chile (introduced in East Africa and Europe). Fruiting Body: Initially a whitish "egg" up to 7 cm across, attached to white cords; rupturing, with the mature fruiting body emerging as a more or less round, cage-like structure, 5-25 cm across, forming 10-30 polygons; arms lumpy, about 1 cm in diameter, not thickened at the intersections, white underneath the olive brown spore slime (formed on the inner surfaces of the arms); the egg tissue creating a whitish volva, but the mature structure often detaching from it. 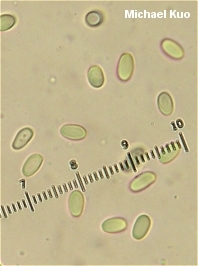 Microscopic Features: Spores 4-6 x 2-2.5 µ; cylindrical; smooth. REFERENCES: Tulasne, 1844. (Saccardo, 1888; Lloyd, 1909; Cunningham, 1944/1979; Dring, 1980.) Herb. Kuo 07041201.